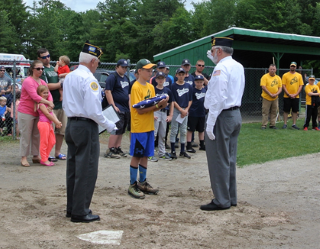 On Sunday, June 24th at noon, Field-Allen Post 148 Honor Guard members conducted a flag ceremony at the little league field at Kiwanis Beach in Standish. Recipient of the flag was Tyler Haskins who had recently lost his grandfather, US Navy Vet, Tom Dame. American Legion Honor Guard members included: David Rendall, Craig Pride, Chaplain and narrator, Richard Drapeau and Post Adjutant, David Tanguay.